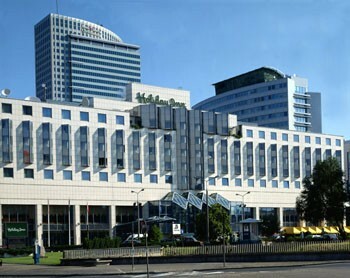 Set in the center of Warsaw, only 300 meters from the Warsaw Central Railway Station, the Holiday Inn Warsaw Hotel offers its guests unforgettable stay in a modern area next to the large commercial and entertainment center Zlote Tarasy. The hotel features 336 luxurious, air conditioned rooms with modern furniture. Guests can choose among suites, executive rooms, rooms for smoking and non-smoking, as well as rooms with facilities for the disabled. In rooms guests will find a private bathroom, high speed Internet access, private safe deposit box, telephones in bedroom and bathroom, satellite TV, pay TV, mini bar, hairdryer, trousers press, pillow menu and tea/coffee making faculties. In suites and higher class rooms guests will enjoy an iron and ironing board, mineral water, fresh flowers, daily press, exclusive cosmetics, dressing gown and slippers. In an elegant restaurant Symfonia guests will taste traditional Polish cuisine as well as theme dishes. Guests will start a day with a delicious breakfast served in comfortable Brasserie restaurant. There are also two fully licensed bars as well as stylish cafĂ© where guests will relax with a cup of coffee and delicious desserts. In the modern fitness center guests will relax in a sauna, whirlpool, solarium or keep fit in a modern gym. The hotel offers hight quality conference and banquet services with reception rooms of 522 m2 space and high quality audio visual equipment. There is also a Business Centre with secretarial staff. The Holiday Inn features also room service, and an underground garage. Click to check the price for the dates selected. This first class modern hotel is situated in the heart of the city. Located close to the business centre and administration offices as well as historical sites and other tourist attractions. It is highly convenient for both businessmen and leisure travellers. The airport is situated 8 km away from the hotel and the railway station is 0,3 km away.